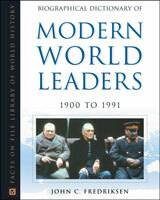 Bringing together biographical information on world leaders from 1900 to the present, the two-volume Biographical Dictionary of Modern World Leaders provides an ideal introduction to the lives and work of the most influential and powerful people on the world stage. Political leaders of every stripefrom the Ayatollah Khomeini to Kofi Annancan be found in this accessible A-to-Z reference set. Approximately 800 detailed biographies are derived from each of the 190 countries of the world, as well as many leaders of states or peoples that are only nominally independent. Each accessible volume includes a further reading list and an index of leaders by country.